It's not often you get to take a trip to New Orleans and stay in the French Quarter, eat some great Cajun food, and have some family time too in the month of December, but I got to do just that. DH and DD joined me on the second day of the USAEE (USA Energy Economists) Conference (yes, I AM just that geeky). We went to a fabulous restaurant on Bourbon Street called the Red Fish Grill. 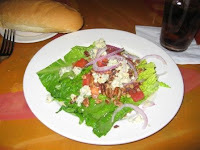 Here is the yummy wedge salad with pecans and blue cheese - almost too pretty to eat. I followed that up with shrimp creole. If you know me, you know I am all about the dessert. It seems a lot of restauants in New Orleans have what is called a fixed menu of several courses and ours had 3 courses and the last course was bread pudding. I am not a huge fan of bread pudding but the waitress said we could upgrade to a chocolate bread pudding that was really good. I'm always game for chocolate so I ordered that. Here it is. It was simply de-vine!! I could not quit making those yum noises all the way through the dessert and the vanilla bean ice creme made it even more heavenly. I have to stop talking about it now, I am making myself hungry! We got to shop and tour the French Quarter several evenings and on Saturday as well. The architecture was beautiful and here is a beautiful garden in the area as well. We even enjoyed some musicians jamming on Bourbon Street. It was un-seasonably cold but maybe that kept the crowds away. Some of the bars, etc. looked fun and we posed in front of some of the funny signs. We also had beignets (a yummy French pastry like a donut but way way better) and chicory coffee (ok, DD had the coffee, I had milk and DH had a Sprite) and the powdered sugar with the beignets was so thick, DD had to make herself a sugar mustache! We also got the opportunity to take a tour on Saturday to see the Lower 9th ward and some other neighborhoods that were really hard hit by Hurricane Katrina and Rita. Living in the Houston area, we are very familiar with a lot of the evacuees from New Orleans and all along the gulf coast. Some of the homes are being rebuilt with help from charitable organizations sponsored by Brad Pitt. We were really hopeful that we might see him on the tour since we were visiting some of his projects (especially DD, I have to admit I used that as incentive to get her to come to New Orleans) but no such luck. We toured a model home that is in a neighborhood that is trying to build back "green". It was really cool and we actually got some good ideas for future building projects of our own (such as collecting rain water to use for flushing toilets). Here is DD and DH in the really airy and nice bedroom. As former renters and later landlords of affordable housing in Oklahoma and Missouri, we were appauled by two things. One, how expensive the new "green" homes were in these areas - not what we would call affordable and also by the fact that so few homes were rebuilt. It appears that there are several governing agencies and they all want to "preserve" the historical neighborhood and its shotgun houses. So that make it very expensive to repair such heavily damaged houses and impossible to just tear the worst ones down and rebuild a basic affordable home in its place. Some organizations are buying properties from those who do not want to come back, getting lots of donations to restore or rebuild and then selling them at a profit. What a racket... As usual, the little guy gets the short end of the deal. Well, on to some FIBER content. Here are a couple of dishrags that I made. The pattern is called Chinese Waves and I used a self-striping cotton that together makes a really thick dishcloth. A fun pattern and easy to do. The third project is a Starburst hot-pad that is three-dimentional. I liked how this project looked in the pattern and I liked how it looked when I got done but I am not super pleased with my color choices and how they looked together. I made it to match some dishclothes I had made for my MIL but the variegated yarn has such a small amount of yellow it doesn't blend as well as I had hoped. She really liked it though, now I just need to convince her to actually use it and not just hang it up for "pretty"!